Sometimes when I’m stuck, I research by skimming through old newspapers online. Using a search field really helps unless you are looking for Peter Beer! I felt drunk after the millionth article was about alcohol instead of a man! This frustration, in part, was the reason for a trip to Kittanning and Leechburg, Pennsylvania in 2004. 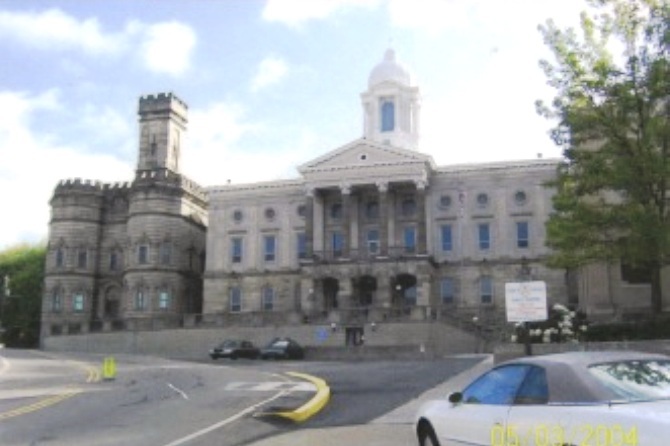 Towamensing Township is located in present day Carbon County, Pennsylvania. It’s an hour and 40 minutes northeast of Harrisburg. In 1843, Carbon County was created from parts of Northampton and Monroe Counties. It is in the 1840 Federal Census for Towamensing, Northampton, PA that I find Solomon Beer. Also on this page are George and John Beer. Most likely I will find all three are brothers or Solomon is their nephew. Solomon is the father to a man named Peter Beer, my 3rd Great Grandfather. I have not concentrated much on the collateral lines of this family yet but I believe Peter was one of five children. It’s possible he was born in January of 1837 in Pennsylvania. Peter can be found in the house of Peter and Margaret Forney in 1850. Peter and Margaret are recorded in the Census records of, ready for another long one, Cowanshannock Township, Armstrong County, Pennsylvania. Unfortunately, the 1850 Census did not give us family relationships. Since Peter and Margaret Forney are 76 and 67, respectively, I assume they are his grandparents or great grandparents. 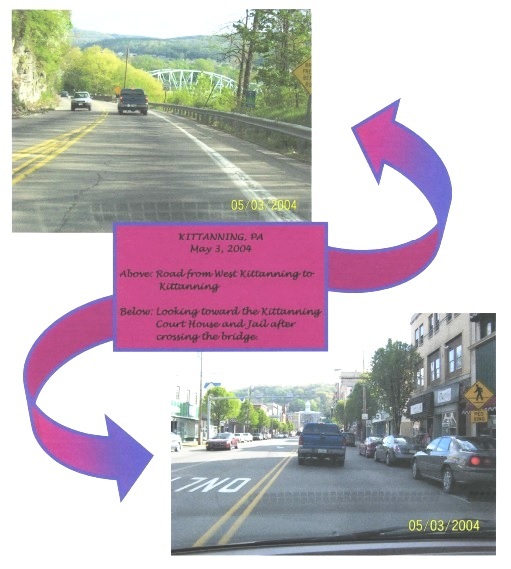 This township is located just east of Kittanning. I fell in love with the area of Kittanning and Leechburg! It felt so quaint. I could have expected to pass my ancestors on the street! My favorite building was definitely the Courthouse and Jail. Pretty efficient and just really cool architecture! Peter served in the Civil War. It is from his pension papers I received a wonderful gift for a genealogist. Peter had laid out his family by his own mouth in 1897! This is a portion of the pension document for Peter Beer laying out his family. Although undated, a very similar document is dated 29 Sep 1897. From this document we have confirmation he married Margaret Spencer and there is no record of the marriage. No wonder I haven’t found it yet! They married on Valentine’s Day in 1856! Being ever the romantic, this is so sweet! Between that time and 14 Aug 1861 they had three children. This document says there are only two living born prior to 1861. I believe their first born, a daughter, named Mary Elizabeth was deceased. My 2nd Great Grandfather, Alexander was born just 7 months before Peter went off to war. 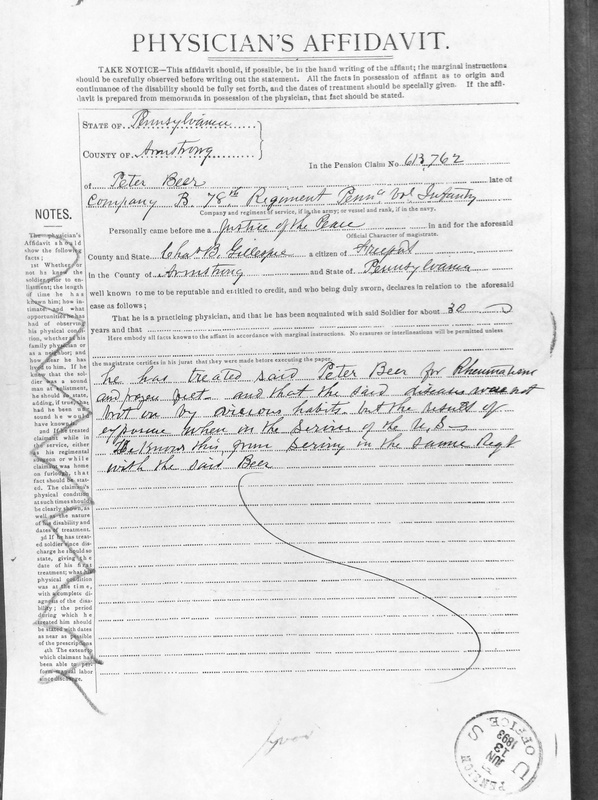 Peter enlisted into Company B, 78th PA Volunteer Infantry as a Private. He was discharged 16 Nov 1865 from Company H, 8th Veteran Reserve Corps. Summary of Peter Beer’s service. Although there this no mention of Peter, I enjoyed reading this letter to the editor of the Indiana Messenger describing their activities. The letter is dated Christmas Day 1861. Peter applied for a pension due to the effects of frozen feet and rheumatism. He initially received a $6.00 per month pension. This is the portion of the Surgeon’s Statement prepared to request an increase in the pension for Peter Beer. This is the first I’ve heard of The Cold New Year’s. Marlitta H. Perkins tells a wonderful tale and sites some writings of soldiers in her blog. I suppose Peter should be grateful he wasn’t one who had the feet amputated. It’s amazing to me how these soldiers survived the war. It isn’t bad enough they could be shot but they actually froze to death at their post. Despite the effects of war, Peter was discharged from Company H, 8th Veteran Reserve Corps in Cairo, Illinois on 16 Nov 1865. I would assume Peter and Margaret took up right where they left off before the war. 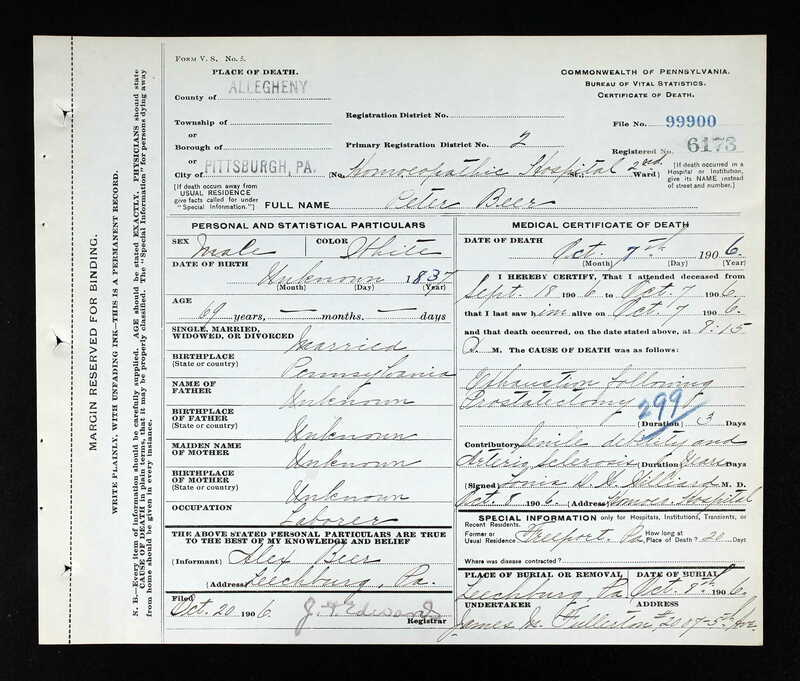 Peter’s experience is probably the reason their next son, born 23 August 1866, was named Washington Ross. The next Census record is 1870. Peter is a laborer, as it seems he was his whole life. He could not read or write. The family is living near Kelly’s Station in Manor Township, Armstrong County, PA. The Disability Act of June 27, 1890 was passed to help soldiers who could not perform manual labor. 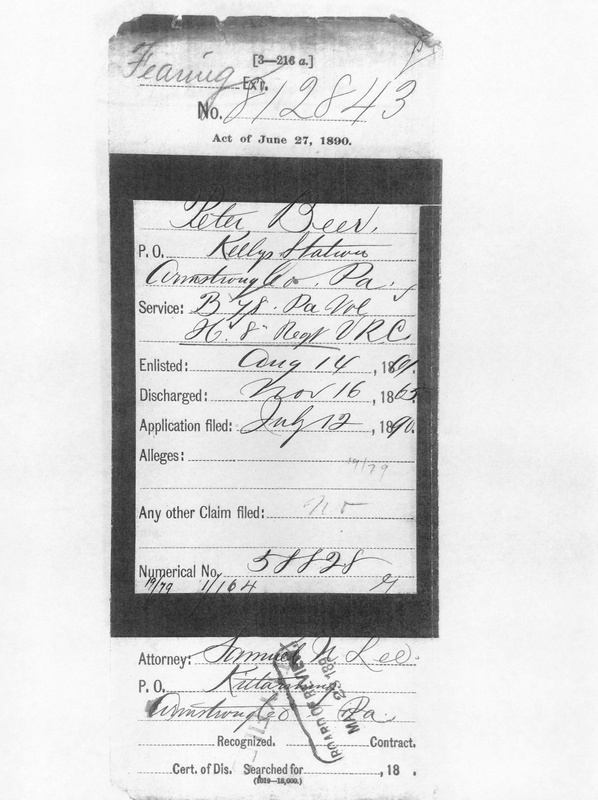 Peter made application and on 10 July 1890 and was granted $6.00 per month. 12 July 1890 Pension approval of $6.00 per month for Peter Beer. Many of the documents in Peter’s pension file are Surgeon’s Certificates. These were completed when Peter filed for increases to the monthly pension. I found them fascinating! The Surgeon describes Peter’s symptoms and ailments. It also gives the physical description for Peter! These are rare genealogy gems! Now I have a better understanding how my own father came to be 6’2″, towering over his parents and siblings. It was the Beer!! Peter Beer’s physical description from document below. Surgeon Certification for request for pension increase. 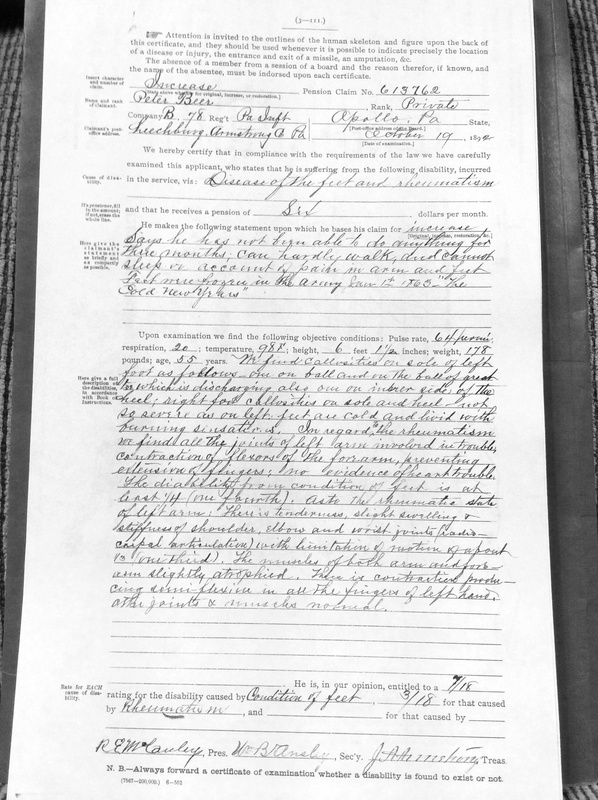 One of my favorite documents, in this rather large pension file, is the Physician’s Affidavit from Captain Charles B. Gillespie, M.D. He served with Peter and states knew him for 30 years! Dr. Gillespie seems to be responsible for assembling the 78th Regiment Company F, which was changed to Company A and B.
Physician’s Affidavit for Pension Application from Captain Charles B. Gillespie, M.D. Peter’s beloved wife and mother of all his children, Margaret, passed away 11 July 1889. There are several comments to this in the pension record. I am unable to locate any other records at this time. 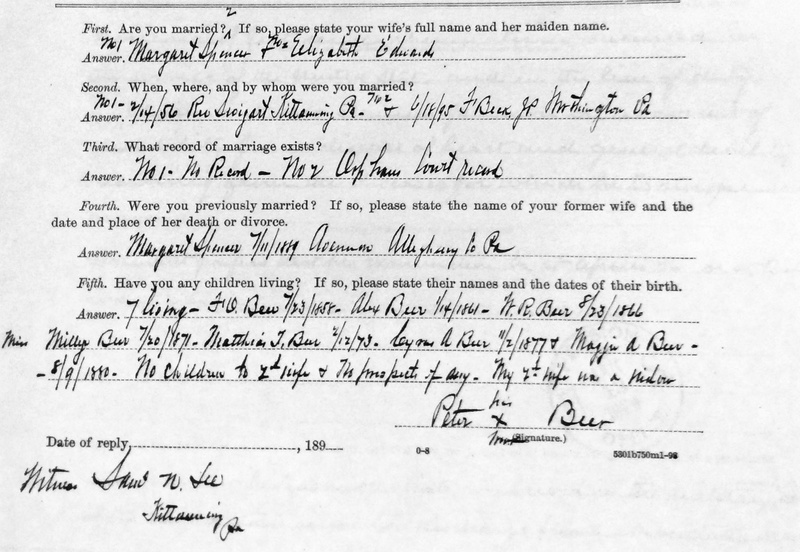 I knew Peter remarried on 18 June 1895 to Elizabeth Booker Edwards, a widow. She is noted in his record also. She appears with him in South Buffalo, Armstrong, PA as his wife of five years in the 1900 Census. What I wasn’t prepared for was the “other” Elizabeth. 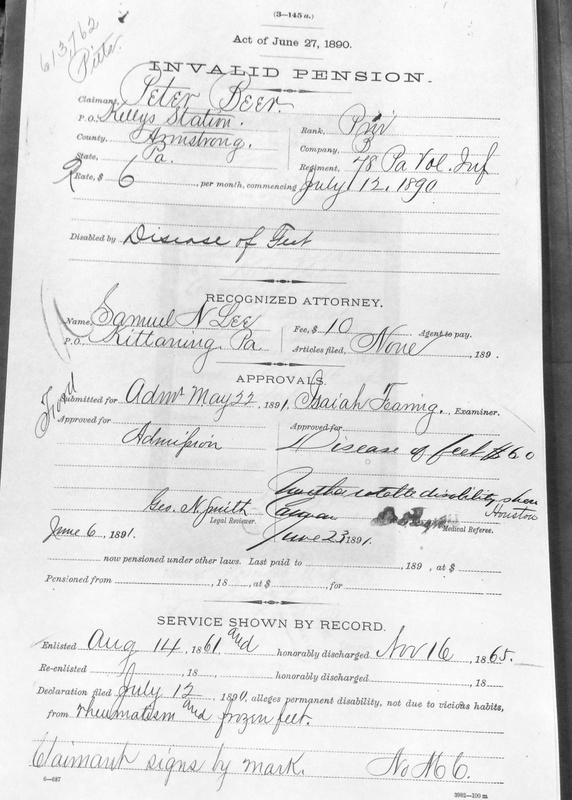 I have no idea what prompted the General Affidavit dated 18 August 1901. Peter is 64 years old. 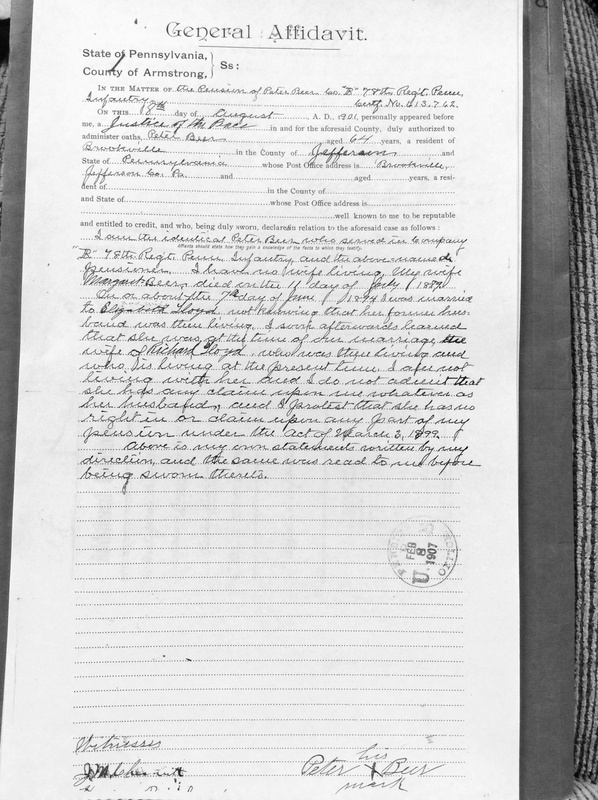 He dictates the document and in part, it says, “On or about the 7th day of June 1894 I was married to Elizabeth Lloyd… I soon afterwards learned that she was at the time of our marriage the wife of Richard Lloyd… who is living at the present time.” What?! It finishes by saying, “…she has no right in or claim upon any part of my pension under the Act of March 3, 1899.” This makes it sound like Elizabeth Lloyd was looking for money. Depending on what you look at, $6 in 1890 was about $180-200 today. Considering before his death, he received $12 a month, that might have made Peter a high prized widower among the women of Armstrong County. Peter’s statement regarding his current and previous marital status. So, this is where I’m at… needing more research, that’s where! Peter married Margaret the 14th of February 1856 and she died 11 July 1889. He next married Elizabeth Lloyd the 7th of June 1894. He then married Elizabeth Booker Edwards the 18th of June 1895. This is assuming the Elizabeth in the 1900 Census is actually Booker Edwards and not Lloyd. I find it interesting, not only in the similarity of their first names, but also their marriage dates. Peter states he does not live with Elizabeth Lloyd but is clearly living with __an__ Elizabeth in 1900. That brings us to Adaline Maguire. I would hope she loved him for the man he was and that she was by his side as he passed. By now, I imagine Peter to be a simple man with a kind heart. Interesting he didn’t have any children with these other women. It makes it seem all the more that his true love was Margaret Spencer. It would be awesome to have letters between them while they were separated during the war but neither read or wrote. I also imagine him to be a man of duty, serving his country through physical hardship, so he could return home to the waiting arms of Margaret. Ok, ok, none of that is factual but this is my blog so that’s what you get!! Peter passed away at 8:15PM on 07 October 1906 having not recovered from prostate surgery. He was also suffering from some level of senility and arteriosclerosis. Peter is buried in Evergreen Cemetery in Leechburg, PA. He is not buried with any of his wives but is near his son and daughter-in-law, Alexander and Mary Ellen Snyder Beer. I visited his grave. (Use the link above to view it.) The stone is simple, it seems, as Peter was. Almost one hundred years later it still stood. As William V. Pool wrote in his pension file, “I have known Peter Beer ever since we went into the service in 1861 he was then as far as I know about him a stout hearty man…”. Stout means brave and determined. Hearty means loudly vigorous and cheerful. To be known by those definitions points to a successful, well led life, Peter Beer. It would have been good to have known you! Thank you for your service!